Hand-picked graphs that illustrate the latest trends in the global energy transformation. You're reading a free preview of the latest GTM Squared insight. Want to receive more vital intelligence like this each and every week? Join Squared today! Last year was intense. It felt like news broke every minute of every day. We're starting 2018 the same way. That intensity certainly held true in the world of data. Our GTM Research analysts were knee-deep in record-breaking numbers, working closely with the editorial team to contextualize the biggest stories in the industry. This week, we're pulling together the most important charts from 2017. In a nod to former GTM Editor-in-Chief Eric Wesoff, we're calling them the charts that shook the earth. Toward the end of last year, Tesla installed the largest lithium-ion battery ever deployed in South Australia. It was a high-profile example of a powerful trend: storage combinations that are starting to compete with natural-gas power plants. According to a GTM Research analysis of South Australia's electricity market, by 2025, solar-plus-storage and standalone batteries will compete with new and existing open-cycle gas turbines for meeting peak load. By 2035, renewables and storage will beat gas for baseload and peak power. According to GTM Research, storage really starts putting pressure on gas peakers in the U.S. within the next four years. In a decade's time, it's no contest. Utilities are catching on to the economic trend. 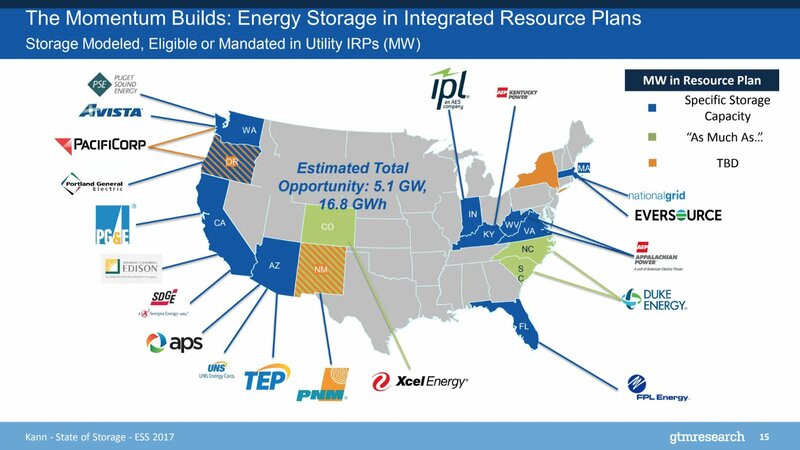 According to a GTM Research analysis of integrated resource plans (IRPs) from utilities around the country, there are already "modeled, eligible or mandated" plans accounting for 5.1 gigawatts of storage. Many utilities are still determining capacity. While California remains a leader in this drive, those commitments are not just in the energy-progressive West. Utilities in West Virginia, Kentucky and Indiana are considering storage in a bigger way, too. 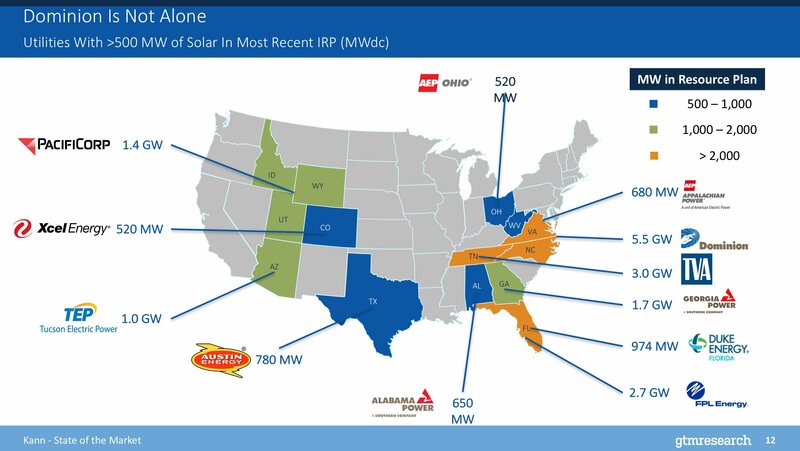 Many of those same Eastern utilities are embracing solar projects in their latest IRPs as well. FPL Energy in Florida has modeled out 2.7 gigawatts of solar power and storage projects. Appalachian Power foresees 680 megawatts of solar and storage projects. As a result, many states are becoming increasingly attractive sites for solar-plus-storage configurations. Last year saw the lowest-priced solar-plus-storage PPA, in Arizona. Colorado already beat that number in Xcel's service territory in the first few days of 2018. 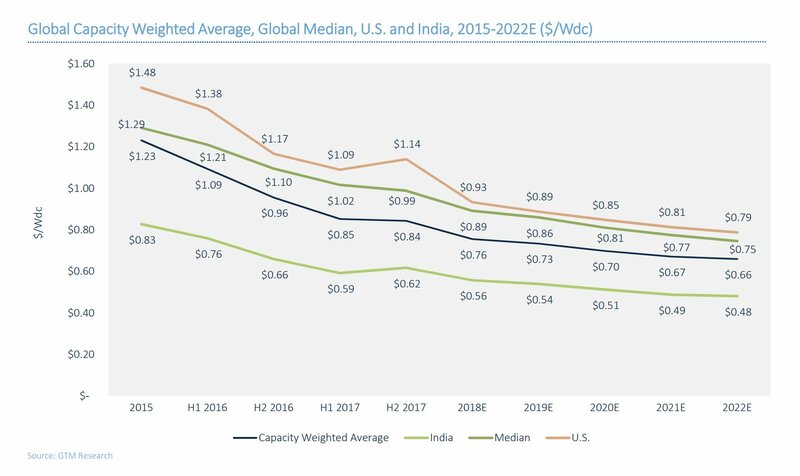 Those utility investments aligned with a continued drop in fixed-tilt, large-scale solar prices around the world. Although the second half of the year brought a slight spike in the weighted average cost of solar -- largely due to module supply limitations -- the long-term trend is down. GTM Research projects average global prices will reach $0.66 by the end of 2022. Analysts estimate U.S. prices will hover a bit higher at $0.79 per watt. Energy giants picked up their acquisition activity in the distributed energy space. GTM Research analyst Elta Kolo called it "a grid edge shopping spree." Solar investments continued. 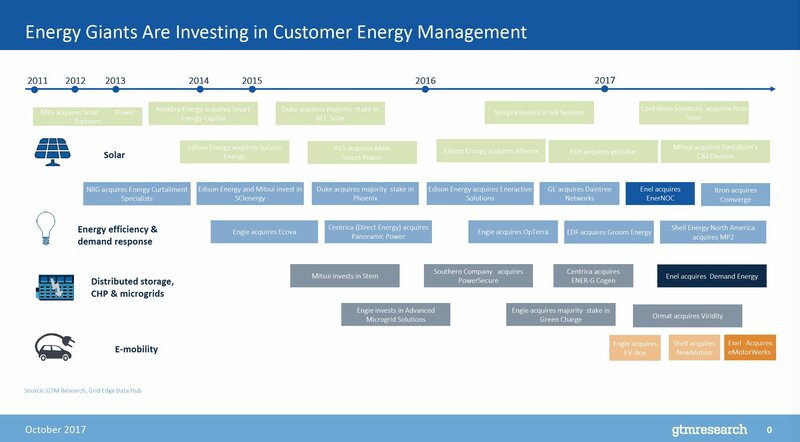 But Shell’s acquisition of NewMotion and Enel's acquisition of Demand Energy and EnerNOC further affirm that utility companies are setting their sights on a diversified portfolio of energy management and production tools. 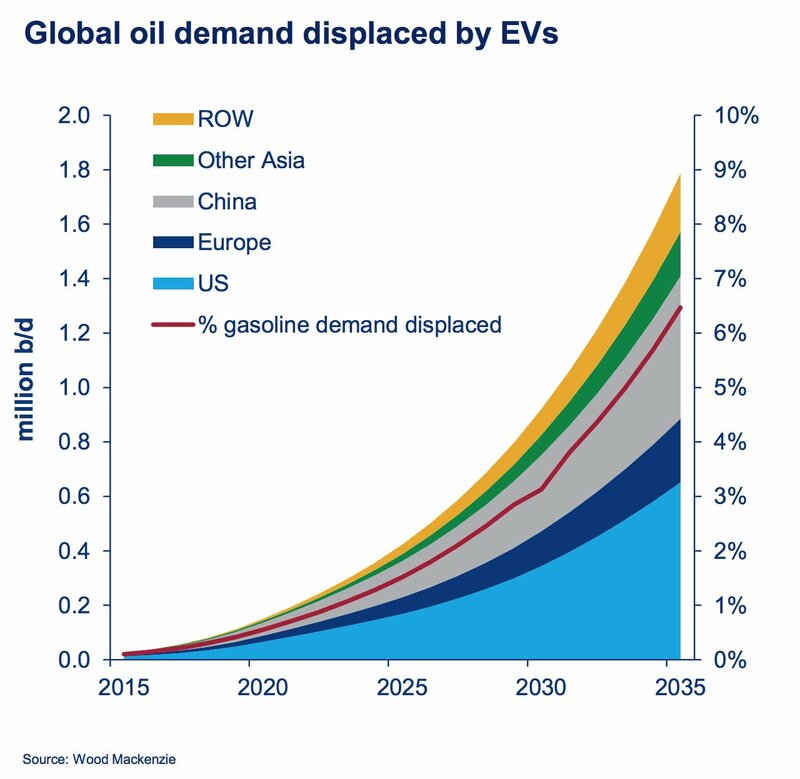 Electric vehicles are slated to displace a growing chunk of global oil demand in the coming decades. By 2035, electric cars should replace 3 percent of global oil demand in the U.S. and about 2.5 percent in China. OPEC upped its electric-vehicle forecasts this year, with projections now rising into the hundreds of millions by 2040. Car manufacturers have also started inching toward acceptance, with major players such as Volvo and General Motors committing to a wider portfolio of electric cars in the immediate future. The Section 201 trade case created a lot of anxiety in America's solar industry. GTM Research modeled a strong drop in installations in 2018 with new tariffs, including Suniva's recommended tariff of 25 cents per watt. GTM Research projects that it will take years for installations to creep up to pre-2011 levels. At the end of October, members of the U.S. International Trade Commission offered recommendations that tariff petitioner Suniva characterized as “weak.” In that recommendation, two commissioners agreed on a module tariff of 30 percent that decreases by 5 percent over four years. Donald Trump has until January 26 to make a final judgment on the case, but the potential tariffs are already casting uncertainty over the country's solar pipeline. Companies are buying up as many panels as possible, signaling concern about the changing economics of projects set to commence later this year. The devastation and (still ongoing) power outage in Puerto Rico woke up a lot of people to the issue of grid resiliency. A September GTM Research report on island power markets coincided with the devastation from Hurricanes Irma and Maria, as well as policy conversations about the role distributed energy should play in models of the future grid. The report showed that solar-plus-storage currently has a higher levelized cost of energy than diesel, which makes up the majority of island power. But by 2025, hybrid solar and liquid natural gas (LNG) systems beat oil by nearly $50 per megawatt hour. Hybrid LNG-solar systems will also be more economical than LNG alone. Toward the end of the year, energy giant AES unveiled a plan to power Puerto Rico with mostly solar and batteries -- at a lower cost than coal or gas. 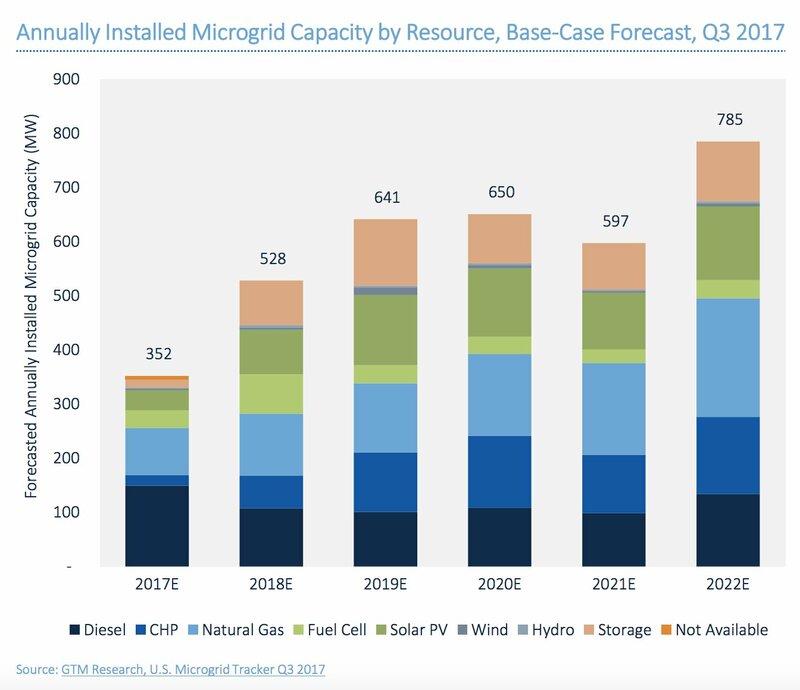 Microgrid installations increased by 76 percent from 2016 to 2017, though capacity did drop because of an increase in small commercial microgrids. While most microgrids installed through the end of last year relied on diesel and natural gas, GTM Research analyst Colleen Metelitsa says the resource mix powering islanded systems will diversify in coming years. Of the 785 megawatts of installed microgrids projected by the end of 2022, a fair proportion will still run on natural gas, combined heat and power, and diesel. But solar systems and storage will power a growing fraction. As islands like Puerto Rico move forward with future resilience plans -- such as the solar-plus-storage minigrid plan from AES or the multibillion-dollar microgrid proposal from New York -- the project pipeline could balloon and diversify further. The data bears this out. 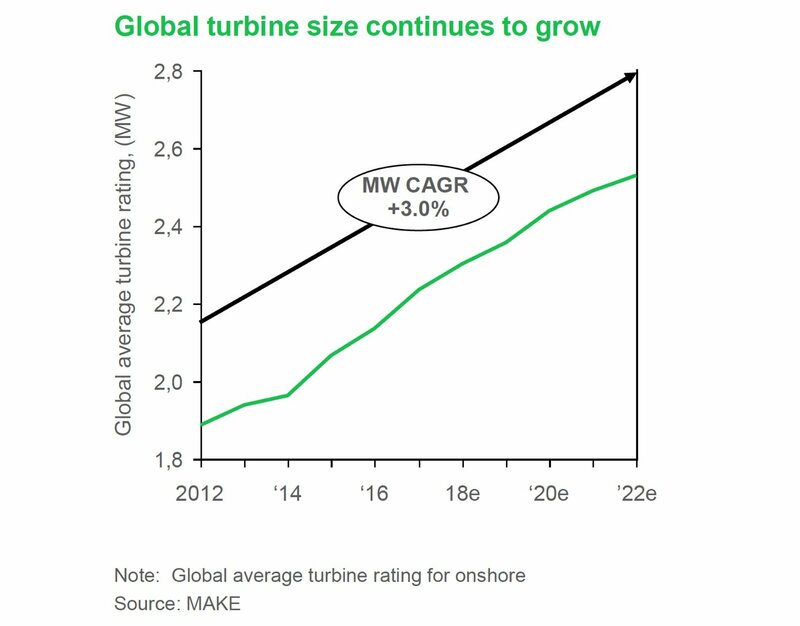 MAKE expects a 3 percent compound annual growth rate for onshore turbine size through the end of 2022. Analysts also expect advanced metering infrastructure to see a high annual compound growth rate: 10 percent through 2022. By that time, the world will have 1 billion meters installed. Asia and Europe will lead much of the growth. India plans to install 50 million meters between 2017 and 2020, and China projects 640 million meters by 2025. 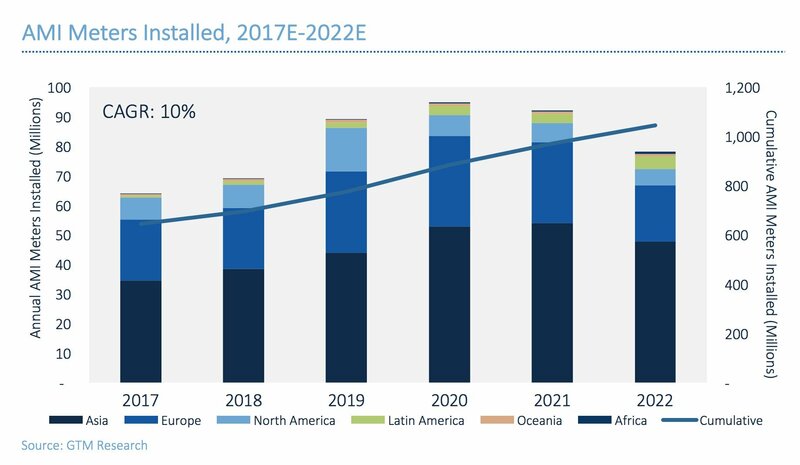 GTM Research projects a slight installation slowdown post-2020 after European Union countries meet the European Commission’s target of 80 percent smart meter penetration by 2020 (although the region will likely miss its goal by a margin of 37.6 million meters). Installations in Eastern Europe and Latin America should temper the decline. And there you have it, 12 charts for 12 turbulent months. Happy 2018, wonks.